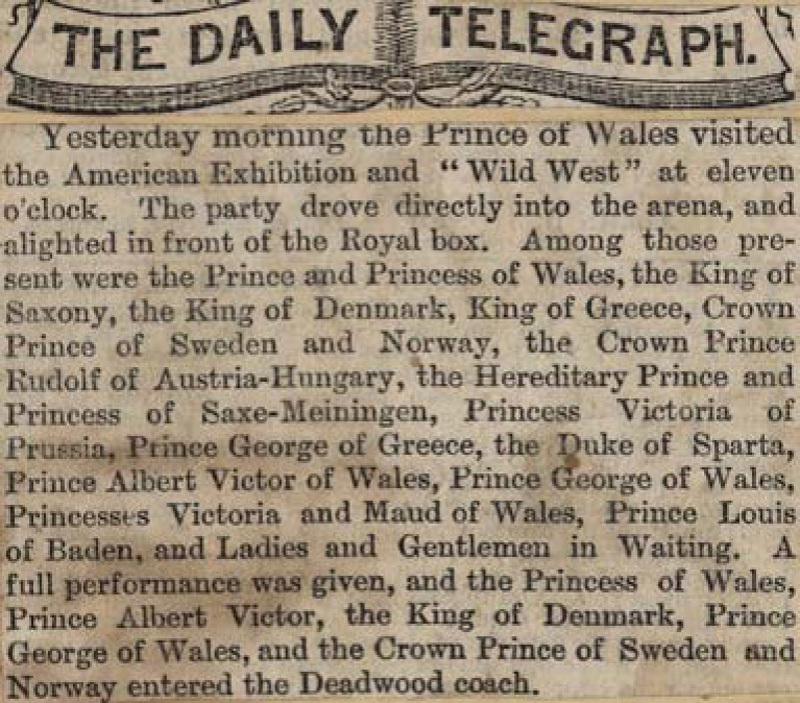 Yesterday morning the Prince of Wales visited the American Exhibition and "Wild West" at eleven o'clock. The party drove directly into the arena, and alighted in front of the Royal box. Among those present were the Prince and Princess of Wales, the King of Saxony, the King of Denmark, King of Greece, Crown Prince of Sweden and Norway, the Crown Prince Rudolf of Austria-Hungary, the Hereditary Prince and Princess of Saxe-Meiningen, Princess Victoria of Prussia, Prince George of Greece, the Duke of Sparta, Prince Albert Victor of Wales, Prince George of Wales, Princesses Victoria and Maud of Wales, Prince Louis of Baden, and Ladies and Gentlemen in Waiting. 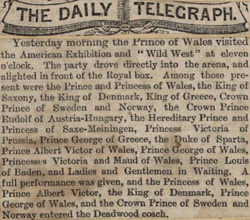 A full performance was given, and the Princess of Wales, Prince Albert Victor, the King of Denmark, Prince George of Wales, and the Crown Prince of Sweden and Norway entered the Deadwood coach.